Ever thought of taking your Car for a Ferris Wheel ride. Yes Car-on-a-Ferris Wheel ride! Architect, Engineer and visual artist John Körmeling has made it possible. In 2000 he designed and converted a normal Ferris Wheel to a Drive-in Ferris Wheel for the art project Panorama 2000 in Utrecht. 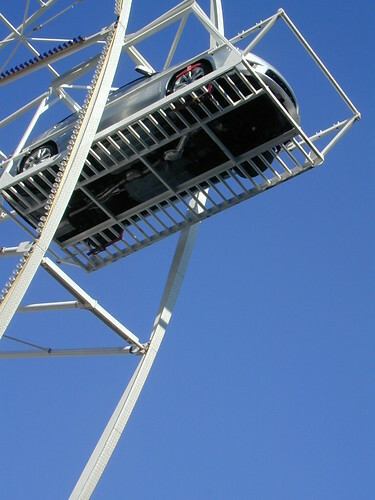 The 33 metres high Drive-in Ferris Wheel could hoists four vehicles at a time and elevates the automobile and its occupants upward, in a slow circular motion to provide a grand panorama of the location. After the initial event the wheel was converted into a "normal" wheel. However the idea soon caught on and this Drive-in Ferris Wheel has since been transported and installed at many fairs and events including Toronto, Orlando and China. 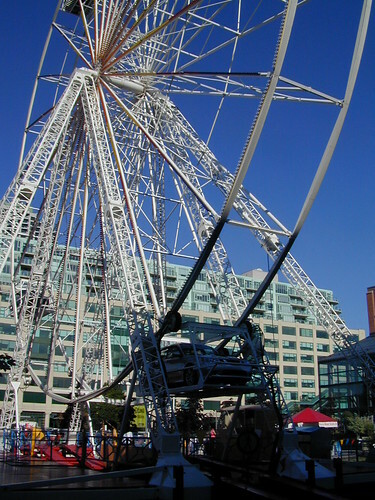 Here is its view at the 2004 Mobile Fun at Harbourfront in Toronto. Location: Sorry no locations have been marked, as the structure keeps on moving from place to place and I have not been able to spot it so far in Google Earth. May be some of my readers will help me locate it. It is in Dutch so you may have to use some on-line translation service.